Being invented and developed by SEK'D Software in Dresden, Germany, A.C.T. 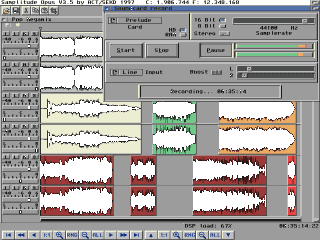 had taken over development of Samplitude Amiga in summer 1997 to allow SEK'D to concentrate on their PC ports and the development of high quality DSP functions (which Samplitude Amiga took advantage of as well) and moved Samplitude Amiga even closer to the major sound application on Amiga. Marc and I continued supporting Samplitude Opus for the Amiga - but on a private basis.